Who will be the new Governor of the Bank of Canada? Governor David Dodge has informed the Bank of Canada's Board of Directors and the Minister of Finance that he will not seek a second term as Governor. While Governor Dodge's term continues until 31 January 2008, he indicated he is making his plans known well in advance to facilitate the selection and appointment of his successor. If tradition is resumed, senior deputy governor Paul Jenkins would obviously be at the top of the list. But since outsiders are now considered viable candidates, names such as Don Drummond (chief economist at Toronto-Dominion Bank), Kevin Lynch (chief clerk of the privy council) and Stephen Poloz (chief economist at Export Development Canada) have bubbled to the fore. Any of those three would be credible candidates, although the internal politics of the Bank would probably exclude at least one of them. But I wonder if the search committee will look to academia this time around. Off the top of my head, I can think of at least 10 professors with whom I'd trust the keys to the Governor's office. One market source said Malcolm Knight, a former senior deputy governor of the Bank of Canada who now heads the Bank for International Settlements, might be a candidate. Deputy Governor Tiff Macklem and Mark Carney, the senior associate deputy minister at the Finance Department, are also considered sharp young forces that could be in the race. Foreigners are buying up Canadian assets. But that's not the real story. The spectre of economic nationalism has returned: foreigners are buying up Canadian-controlled firms. Oh my! - Canadian investors are buying foreign assets at an even more rapid rate. Since 2000, Canadian net purchases of foreign stocks were about $C 60b more than foreigners' purchases of Canadian stocks. - Canada has been running a current account surplus for several years now, so our net international investment position has been improving. If Canadian investors wanted to, they could be buying up foreign-controlled Canadian assets. But they're not. The story is not that foreigners are buying Canadian assets. It's that Canadians are selling them in order to buy foreign assets. Portfolio diversification: it's a good thing. ...is right here. Go read it. It's unlikely that the Bank will increase interest rates next Tuesday, but it would appear that they can't leave monetary policy on autopilot for much longer. I’ve argued for years, with much of the left, that average worker pay has lagged productivity growth mainly because of the increased bargaining power of capital vis a vis labour due to “globalization”, attacks on unions etc etc. There's another explanation. 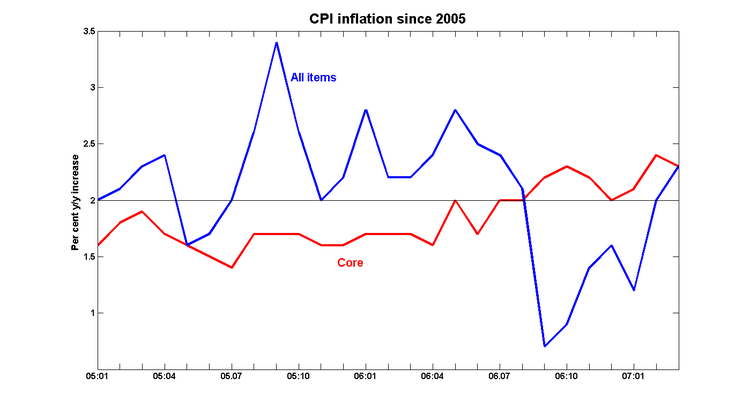 It turns out that the way real wages are measured - using consumer prices or producer prices - matters a great deal here. Movements in the labour terms of trade - the ratio of producer to consumer prices - can erode or accentuate wage gains associated with increasing productivity. I've done this exercise for the US, so now let's look at the Canadian experience. Reports of the retreat of globalisation in Canada are greatly exaggerated. Everyone knows globalization is an irresistible worldwide process enveloping every economy, including Canada's, in its market-driven tentacles. Right? In fact, since 2000, Canada's economy has been curiously de-globalizing before our eyes. The importance of global markets to our employment and production has been diminishing, not increasing -- and at a remarkable pace. In 2000, Canada's total exports were equivalent to 45.6 per cent of our GDP. That was the highest share ever, and reflected the effect of globalization on our economic orientation. After then, however, globalization began to unwind for us, and the export share began to fall. By 2006, it had shrunk to just 36.5 per cent of GDP. 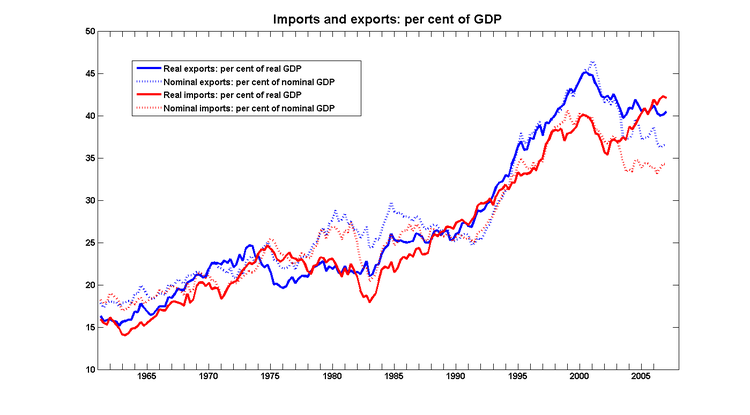 This decline in the importance of international trade is utterly unprecedented in Canada's postwar economic history. Incredibly, Canada's economy (excluding energy) is now less dependent on exports than it was in 1994, when the North American free-trade agreement was signed. Exports are now falling in economic importance more quickly than they expanded in the early years of continental free trade. (Emphasis added.) Why would we exclude energy, when the most important thing driving the Canadian economy is an energy-price-induced terms of trade shock? The whole point of the sectoral shift story we're seeing is the increase in production and exports of the energy sector. A word of caution is required here, because this measure -- exports as a share of GDP -- is somewhat misleading. It includes the value of imported commodities (such as auto parts) that are then processed and re-exported in another form (such as finished vehicles). This is the only mention of imports in the column. I don't understand how the increase in cross-border integration of production processes can be so easily dismissed in an article that argues that globalisation has become a weaker force in the Canadian economy. Another puzzle is why the appreciation of the CAD doesn't show up in this analysis. A 30% appreciation in the CAD is a much more plausible explanation for a decline in exports than a story based on the retreat of globalisation in Canada. But more fundamentally, it's hard to see how an examination of the effects of a terms of trade shock could be interpreted as being evidence that the importance of the global economy is diminishing. There's one factor that they don't seem to have examined: demographics. 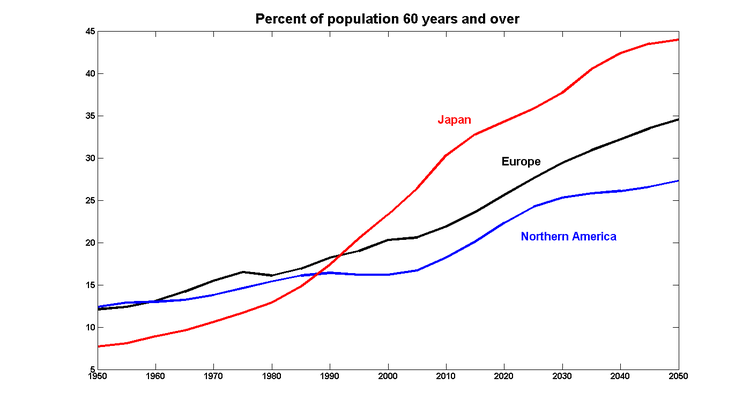 One of the implications of an aging population is an increase in the percent of people who are retired. If at least part of their retirement is financed out of accumulated savings, you'd expect that capital would generate a larger share of total income - which means that the labour share would have to fall. The decline in the labor share since 1980 has been much more pronounced in Europe and Japan (about 10 percentage points) than in Anglo-Saxon countries, including the United States (about 3–4 percentage points). Rather than carpool, drivers adapt to gridlock: analyst. Drivers are getting more cozy in their fully equipped cars and becoming accustomed to gridlock, which one traffic analyst said is leading to the demise of carpooling. "[You have] entertainment systems, you have language lessons, you have cellphones," said Pravin Varaiya, an engineering professor at the University of California at Berkeley. "It's your little space and you have some free time, if you can call it that." Varaiya said that when the first High Occupancy Vehicle (HOV) carpooling lanes were introduced more than 30 years ago, drivers were considerably resistant. "There was a lot of protest — 'Here's an empty lane and we are all stuck,'" Varaiya said. Instead of changing their travelling habits and arranging carpools of three or more, drivers instead adjusted to gridlock, he noted. Spot the missing G-7 country. Its population is roughly the same as the top five countries put together; the vast majority of which are able to read English. Berkeley's Emmanuel Saez and Mike Veall at McMaster University have a paper (AER version; NBER version) on how the top end of the income distribution in Canada has evolved over time. (Saez has of course been involved with many other projects using US data.) Happily for me, they've posted what is now my favourite excel file so that I can get a better feel for a fascinating piece of work. I was aware that the share of income at the top end of the distribution had risen in recent years, but what I hadn't realised was just how concentrated those gains were. In fact, they're so strongly concentrated that the income distribution is self-similar: it looks the same regardless of how closely you zoom in. It's not quite as fascinating as all those cool Mandelbrot sets (example here) that popped up when chaos theory was fashionable, but it's still worth looking at.